Skin glue is a special glue that holds a wound together. It is used on the face, arms, legs, and torso. It can also be used on small lacerations. It is not used for lips, lacerations that are over joints, deep lacerations, or most hand and foot lacerations. The laceration will be held shut. Next, a thin layer of skin glue will be applied over the area. Warmth may be felt as the glue sets. Skin glue will be applied in 3 coats. The wound will then be held in place for 60 seconds. A bandage may be placed over the area over the wound. Skin closure strips are adhesive strips that help close the laceration. They may be used in lacerations that are clean, shallow, have straight edges, and are easy to push closed. Hair tying is used for some scalp lacerations. Hair will be gathered in a way that pulls the wound shut. The hair will then be rubber banded or held together with skin glue so the wound remains shut. Skin glue will fall off in 5-10 days. Skin closure strips will typically be removed after 5-10 days, or they will fall off on their own. 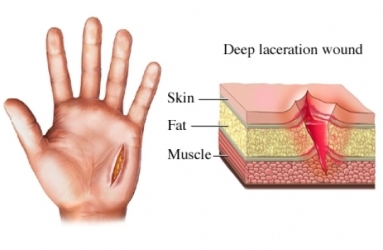 Laceration management. EBSCO DynaMed Plus website. Available at: https://www.dynamed.com/topics/dmp~AN~T129892/Laceration-management . Updated October 25, 2016. Accessed December 21, 2017.